Think you want to go powered hang gliding…but you have some questions? This collection of frequently asked questions (FAQ) provides answers to many common questions about Hang Gliding Tahoe lessons. My wife and I want to go at the same time, can we? You can go up with your wife, brother, sister, father, mother, kid, friend, etc… with our new ‘Fly Together” program. Each trike can fit one instructor and one student. We have two trikes, two instructors and you can fly together in separate aircraft at a safe distance. This is by special arrangement only so please book in advance to make sure you can do this if it is important to you. 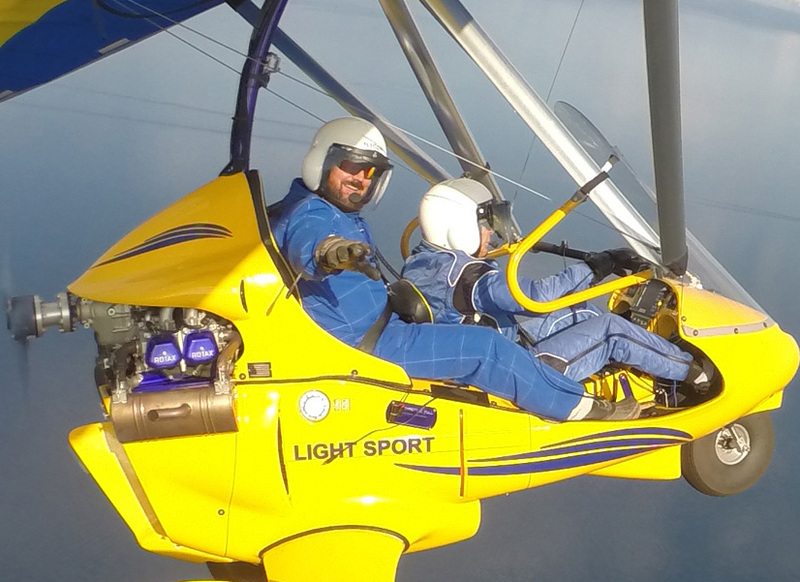 This is an awesome experience to fly together each with your own flight instructor and trike. We fly as close as possible depending on weather conditions. Can we sit next to each other for the Fly Together? There are only two seats in the powered hang glider, one for the flight instructor and one for the student. We have two trikes and two qualified FAA instructors so you each can go up at the same time in separate aircraft for the “Fly Together”. Can I bring a camera or video camera up with me? No because of safety. If a camera, lens cap, glove, or anything goes through the prop, this is very bad. Therefore, we have designed, engineered, and certified camera systems that are safe. This way you can get great pictures safely. So for everyone’s safety, no cameras can be taken up. This is a hard rule and for safety which is one of our top priorities. Because of the altitudes we will be flying at, it is recommended that you wear close-toed shoes and socks. No open-toed shoes or sandals. Long pants and a light jacket or sweatshirt are advised if you get cold easily. We provide a stylish flight suit which fits over your normal clothing. Generally, if you come dressed and comfortable for the temperature outside or driving over the mountain pass, the flight suit will keep you warm with the wind and altitude gain. We have heated gloves for the colder days. It is like riding a motorcycle in high mountains. No, this is much more. This is an interactive flight lesson which introduces you to the basics of flight. This is commonly known in the aviation community as an introductory, demonstration, and/or a discovery flight. It is “Flight Training” as defined by Federal Aviation Regulations (FAR) Title 14, performed by an FAA Certificated Flight Instructor (CFI) in an FAA approved aircraft. It introduces you to the “passion of flight” where you can pilot the aircraft and feel the freedom to fly while getting a new perspective of the world. Ask any pilot about their first flight where they fell in love with aviation and they will beam as they tell you about it. During the HANG GLIDING TAHOE experience, some take the controls minutes after takeoff and fly most of the time (except takeoff/advanced maneuvers/landing), while others are a bit scared and do not want to take the controls. Either way, you learn the basics of flight and can continue learning to fly, or remember this as an experience of a lifetime. This intro/demo flight is the first lesson in the comprehensive “Hamilton Pilot Training System” that can take you all the way to becoming a real FAA certified pilot. You get an official logbook entry which qualifies as official training time towards your FAA pilot license. Any flight is scenic, it is one of the benefits of flying. If you only want a tour or a ride, we recommend a bus, boat or a helicopter. If you want to experience an interactive flight lesson and the “Freedom” of flight, this is for you. How long is the lesson and flight time? Lesson times start after you sign in and we prepare you for the flight by putting on the flight suit, obtain a short safety briefing and enter the aircraft. The lesson ends after you take off your flight suit and get your log book endorsement for the lesson time. A 60 minute lesson is typically 50 to 60 minutes in length. The time you are in the trike taxiing and flying is 40 to 50 minutes and the time you are actually airborne with the wheels off the ground is 35 to 45 minutes. A 90 minute lesson is typically 80 to 90 minutes in length. The time you are in the trike taxiing and flying is 70 to 80 minutes and the time you are actually airborne with the wheels off the ground is 65 to 75 minutes. Flight times will vary depending on the weight loading of the aircraft, weather conditions and air traffic. What about the weather? How often do you cancel due to weather? With aviation, weather is always a consideration. We utilize all NOAA, FAA flight service information and local observations/predictions available. With this in mind, it is best to book your reservations in advance at the beginning of your vacation, so if we do have a bad weather day we can reschedule you while you are here. We will contact you on your mobile phone as soon as possible, usually the night before or in the morning if there are any changes due to inclement weather. It is usually the winds aloft (high altitude winds) over the mountain passes that make flying less comfortable because of the bumps that we want to avoid. During the summer we are able to fly 95% of the time, during the winter we can fly 90% of the time so overall chances of flying are very good. We have a 48 hour cancellation policy. When you book a reservation you are reserving a time slot specifically for you. 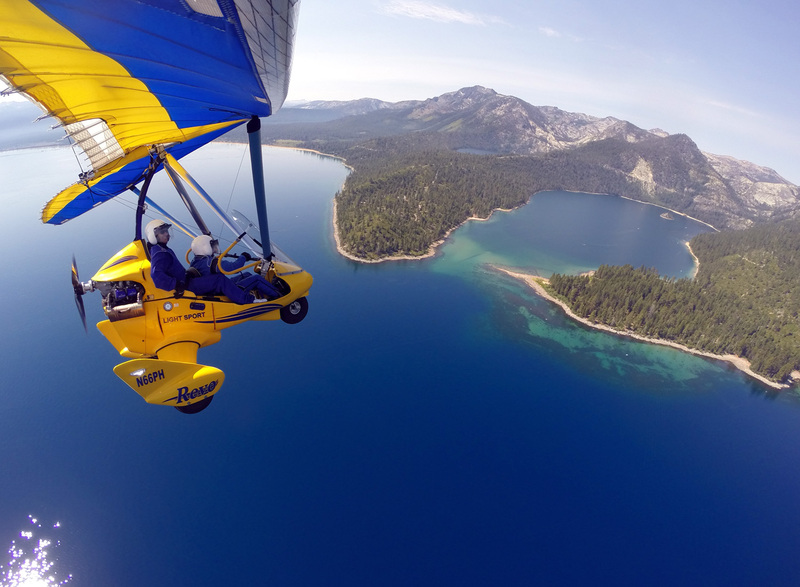 Hang Gliding Tahoe arranges all other bookings around your reserved time slot. If you will be unable to honor your reservation, you must call and talk with us to let us know at least 48 hours in advance so we can book someone else for this valuable time slot. PHONE CANCELLATION ONLY. NO EMAILS ACCEPTED. We have a 100% safety record and the REVO Trike has been tested for 6 G-forces positive and 3 G’s negative, that’s higher than most conventional airplanes. This is a FAA approved special light-sport aircraft (S-LSA) tested to strict industry standards. It is maintained and inspected by FAA certified mechanics. We also only fly in fair weather with a backup ballistic parachute system making this safer than other aircraft.ur mobile phone as soon as possible, usually the night before or in the morning if there are any changes due to inclement weather. It is usually the winds aloft (high altitude winds) over the mountain passes that make flying less comfortable because of the bumps that we want to avoid. During the summer we are able to fly 95% of the time, during the winter we can fly 90% of the time so overall chances of flying are very good. Is the engine very loud? The engine has a four blade prop turning slowly, an intake silencer and an exhaust silencer all designed for noise reduction. In addition to the aircraft noise reduction features, you will also be wearing an intercom noise cancelling headset which reduces the sound of the engine and allows clear communication during your flight with the instructor. The REVO Trike is a powered hang glider designed for safely gliding to a landing area with or without power whether the engine quits or is shut down on purpose. How does this compare to a balloon ride? A balloon ride is floating not flying. You are suspended in one place. It is like sitting on a park bench in one place that goes up and down, rather than going somewhere and seeing more areas, which you can do in the powered hang glider. In a balloon ride you are packed in with a number of people and go up and down. In the powered hang glider you have your personal pilot/instructor and go where you want and as high as you want. You are in control with the powered hang glider, you can do the flying if you want. Although we generally fly early in the morning same as balloons, we fly much later in the day so you do not have to get up quite so early. We can fly all day in the higher winds but we attempt to be finished by 11:00 AM in the summer to provide a smoother and more enjoyable experience before the air “bumps” get uncomfortable. How does this compare with a sailplane ride or soaring? The biggest difference is that in a sailplane, you are inside. In the powered hang glider you are outside. It is like the difference of being inside a car or outside like on a motorcycle. The visibility is much better in the powered hand glider because you can look down rather than just out the side of the sailplane. The sail plane is generally a “ride” rather than a lesson where you get to fly the powered hang glider if you want and have a FAA certified flight instructor at your side. Typically the sailplane flies in the smooth air where you tow up and glide right down, or in the bumpy air where you circle around in one place to gain altitude. In a sailplane you need to stay near the airport and high so you can safely glide back where a powered hang glider you can explore where ever you want, get low, skin the ground and climb back up. The sailplane is quieter with now engine, but the powered hang glider has high tech noise canceling headsets so it is more quiet than you would expect. For those who want the complete silence of the sailplane or the un-powered hang glider, the engine can be shut off in flight and restarted no problem. How does this compare with skydiving? Skydiving is very quick. You are packed into the airplane for the long climb, typically not able to see out, than you jump out, free-fall, open the chute and glide back to the landing area. Skydiving is one of the most adrenaline pumping, thrilling and extreme sports there is. However, you do not see much and it is over quickly. Typically you are more focused on the falling and the anticipation of the parachute opening rather than looking around and enjoying the area. How does this compare with parasailing? Parasailing is getting dragged behind a boat similar to water skiing, except you go a couple hundred feet into the air. There’s very little control. Parasailing can be done at almost any popular lake similar to water skiing where powered hang gliding can be done at very few places in the world. How does it compare to a helicopter tour? A helicopter tour is where you are inside like being inside a car or a tour bus. A powered hang glider you are outside like being on a motorcycle. The visibility in a powered hang glider is much better since you can see out both sides. Sometimes in a helicopter, you can be in the middle and not see very well out either side, or at least not be able to see out one side or the other. Another big difference is that in a helicopter, you cannot fly it yourself you want to. Helicopters are very difficult and tricky to fly so you can not try to control it yourself. The powered Hang Glider is easy to fly so you can fly it yourself if you want. It is the simplest and easiest aircraft to learn to fly and many people start flying it right after takeoff until final approach for landing.